before I die. | kensfolk. Monday was my birthday. I use this day as a place marker. Most people mark the beginning of every year as January first (shortly before popping “one last” cigarette in their mouth). But for me, my birthday really makes me stop and recognize where I am as a person in comparison to the last. It’s a formal goodbye to a time that I will never have the ability to go back to. Life is so much more romantic in retrospection, isn’t it? This was the first year that I didn’t want to move forward. I’ve always yearned to be on to that next glamourous life step- on to driving a car (that beautiful maroon minivan in all her glory), on to a curfew past 11, on to graduating, on to being on my own, on to the “real world”. But when I blew out my candles this year, I realized I didn’t want to rush forward. I had a lot to figure out right here, Father Time, and if you’d kindly give me a second to breathe. I had an overwhelming sense of nostalgia all day as I continually mentally replayed where I was at each of my last couple of birthdays and who I was sharing it with. 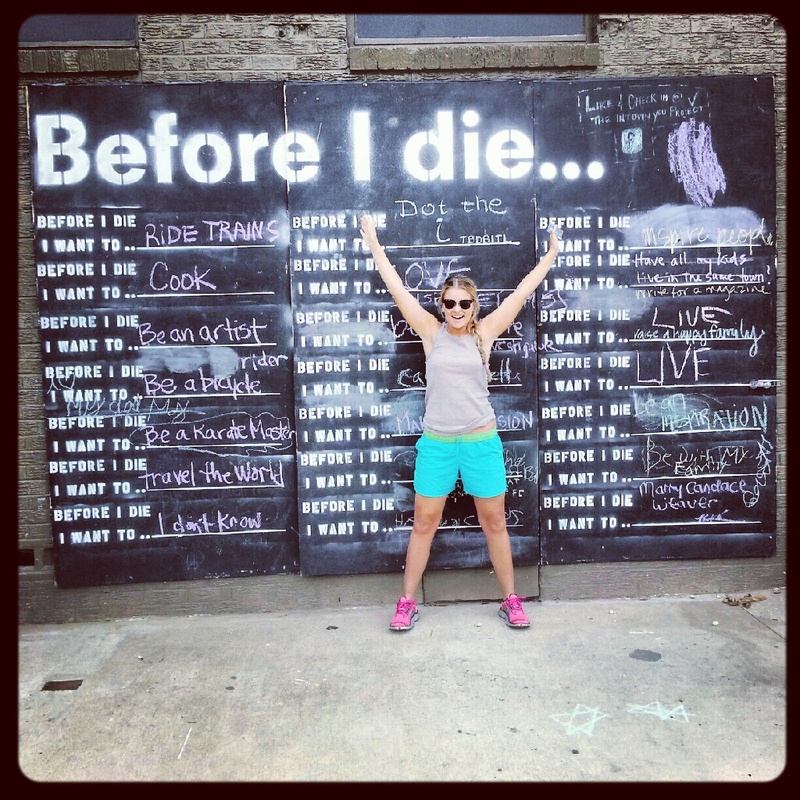 During a hike with a friend that morning, we stumbled upon a chalk board wall titled “Before I die..” with blanks inviting strangers to proclaim their deepest desires. It was a moving thing to read, in someone’s own handwriting, what they wanted to accomplish before their breath of life had expired. I picked up a piece of chalk, and sat there wondering what to scribble down. I thought of a few things, but realized fear was keeping me from writing them down. “It’s just a stupid wall, Kendall… a game… just put something.. people are staring at you now..” I didn’t want to write (in public, no less) the desires of my heart that I, quite frankly, doubted would/could actually happen. But even more so, I was scared those dreams would rip me farther away from the past. That was when I realized why I didn’t want to move forward. I didn’t want year 22 to have 365 days of not being in the past. I was struck, that if I was being honest, I would have chalked up “I want [insert various parts of my life] to be like they used to be” on the blank line behind the painted “Before I die..”. I was missing a time that was inside a closed book. I realized I couldn’t revisit my past birthdays even if I wanted to. Even if, today, I went back to where I lived, to who I hung out with, and what I did, it wouldn’t be the same. That time was delicately wound together by the vast intricacies of the people, situations, intentions, and circumstances that not only represented myself but everything around me in that one split second of life. And if I couldn’t go back, I shouldn’t be scared to write what I want for my future. Yes. Those things will separate myself even more from my past, but I have better things ahead of me than behind me. I finally wrote down a few life long dreams of mine. And unless I wanted to start every year wishing it were the last, I had better get after them.